Solly Hemus had a knack for getting on base atop a Cardinals lineup stacked with Hall of Fame hitters. In 1953, Hemus established a Cardinals record when he reached base safely in the first 33 home games of the season. A left-handed batter who primarily played shortstop, Hemus was listed at 5 feet 9, 165 pounds. In 11 big-league seasons, Hemus had an on-base percentage of .390. Usually batting first or second in a 1953 Cardinals lineup with eventual Hall of Fame inductees Stan Musial, Red Schoendienst and Enos Slaughter, Hemus ranked sixth in the National League that year in most times on base (261). Hemus didn’t bat for a high average, so he depended on working walks and getting hit by pitches to boost his on-base percentage. In his first 55 games overall in 1953, Hemus reached base 108 times _ 62 hits, 43 walks and three hit by pitches, including one that knocked him cold, The Sporting News reported. Hemus led the National League in most times hit by pitches (12) in 1953, one of three times he led the league in that category. Hemus finished the 1953 season with 163 hits in 154 games and 86 walks. He scored 110 runs and achieved double figures in doubles (32), triples (11) and home runs (14). Though a favorite of Stanky, Hemus’ assets on offense couldn’t overcome his liabilities on defense. “Hemus is handicapped by limited range and, though he has adhesive hands, his throwing arm isn’t top-grade either,” Broeg reported in The Sporting News. Though better suited for second base than shortstop, Hemus couldn’t supplant Schoendienst at second. 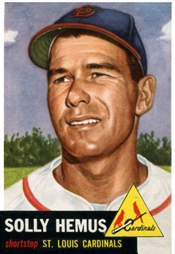 Alex Grammas became the Cardinals’ starting shortstop in 1954 and Hemus became a utility player.